We’ve just received our weber bullet and it was time to take it out for a test run. 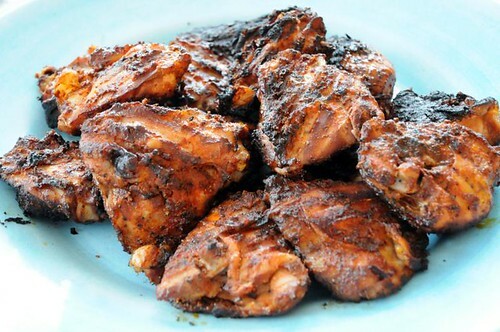 We decided to do Virtual Weber Bullet's basic barbecued chicken recipe for beginners. Ideally you'd use half or quartered chickens, but we wanted to do something a little smaller since we're hoping to land on the perfect way to cook drumsticks eventually. (Great way to feed many - and we've volunteered to do food for our pre-school's next workday.) Our store was all out of good drumsticks, so we used chicken thighs, bone-in. Let the smoke chips, if you’re using small chips instead of chunks as we were, soak in water for a minimum of 30 minutes. Chunks don't need to soak at all. 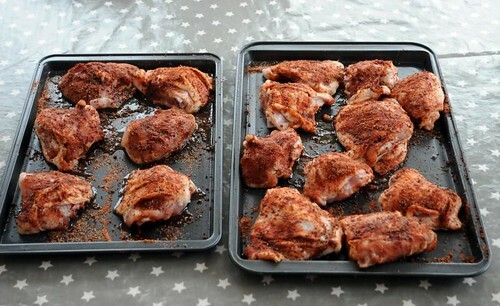 We used VWB:s all-purpose dry rub as suggested but in the future we will reduce the amount of salt a little. Our chicken was frozen, and in Sweden, almost all frozen chicken has been infused with saline and is already a little salty. Combine all ingredients and mix thoroughly. 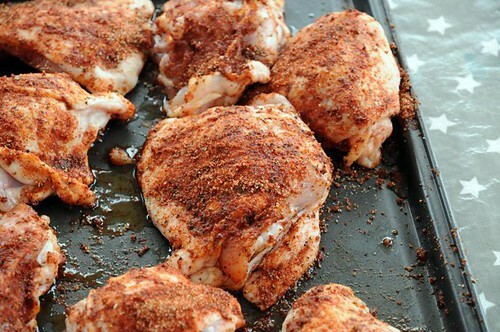 Rub all over your chicken, and let it sit at room temperature for about an hour. Lighting the smoker was more difficult then expected. Using paper in the chimney starter was tried twice and failed. Good thing we also had paraffin cubes, and with those the coal got started nicely in the chimney starter. 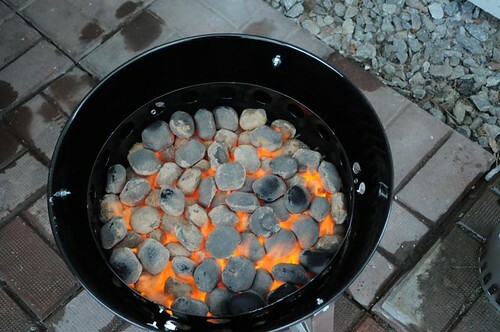 We followed VWB:s suggestion and used 1 full chimney starter with lit briquettes (approx. 3 kg) and one half chimney starter with unlit briquettes (approx. 1,5 kg). 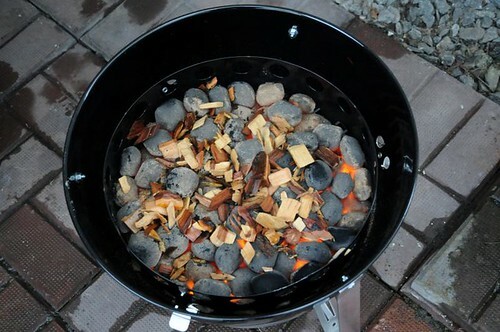 When all of the briquettes were covered in grey ash, the pre-soaked wood was applied. We used two parts apple and one part hickory. This recipe doesn’t call for temperature control so during the entire cooking process the water bowl was empty and all vents were fully open. Cooking Log - this is how we cooked it. All temperatures in F, as that's what's shown on the smoker itself and what most recipes available use. +65 mins: 300° F Chicken was turned skin side down and placed directly over the briquettes for a couple of minutes to crisp up the skin. 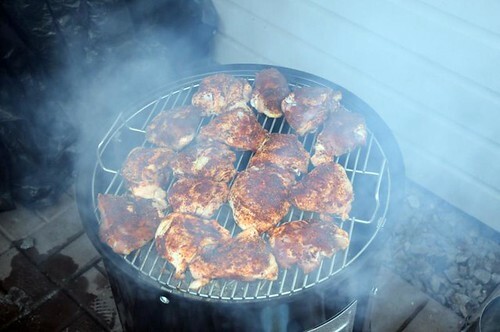 The result was perfectly cooked chicken thighs with a great smoky tasty. We served them with corn bread, goat's cheese and pear quesadillas and onion rings. That looks so delicious and I'm always down for smoked foods of almost any kind. I'm looking forward to Spring and giving something like this a try. Many thanks for sharing.